This is the story of England’s first known poet. Once upon a time, many many years ago, there was a good herdsman who lived on a cliff top called Streaneshalch. The herdsman’s name was Caedmon; he was no spring chicken and was actually quite shy. Nearby on the cliff top was a great Abbey, ruled by a kind and gentle Abbess called Hild, where they sometimes held sumptuous feasts. Now in those days it was customary at feasts, as the wine flowed and everyone ate jelly and ice cream, for each guest to entertain the happy throng with a song. Yes. But Caedmon had a terrible voice and couldn’t play the harp for toffee. So when he could see his turn approaching he would slink outside and go home, or hide in a barn. Caedmon woke up and dashed off to tell the kindly Abbess what had happened. Hild summoned some other wise people so that Caedmon could sing to them. He repeated the song from his dream and they all agreed this was a Gift From God. Indeed, they asked him to put a particular piece of writing to verse, if he could, and were delighted with the result when he returned with it the following morning. Hild had him inducted into the monastic life, so that he could learn all the stories of the scriptures. And Caedmon spent the remainder of his days turning dry text into melodious verse, and singing of the works of God and stories from the scriptures. He had a premonition of his own death and passed away peacefully in 680AD. As his songs spread, so did the Christian message. Clever, eh? And that, more or less, is Caedmon’s story. I lied about the jelly and ice cream and the tale itself of course might be complete fiction. But Caedmon is famous for being the first known English poet and is sometimes called ‘the Father of English song’; and you thought it would be someone like George Harrison or David Bowie, didn’t you? 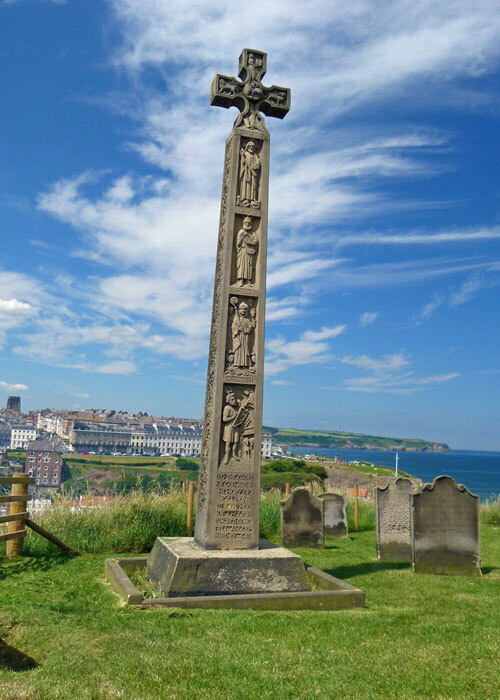 On 21st September 1898 a huge crowd gathered in St Mary’s churchyard on Streaneshalch in Whitby to see a cross in honour of Caedmon unveiled by the then Poet Laureate, Alfred Austin. The cross was the brainchild of Canon H D Rawnsley, one of the founders of the National Trust. It cost £350 – an enormous sum of money in those days – and is an echo of an Anglo-Saxon cross, made from Northumbrian sandstone. It stands 20 feet high and is richly carved with Christian iconography, including rather fetching representations of Hild and Caedmon. 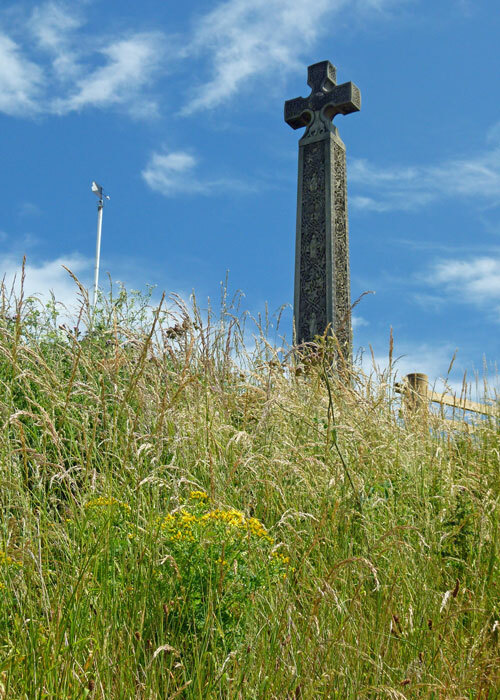 The cross stands at the top of the 199 steps overlooking Whitby, and in the shadow of the ruined medieval Abbey Church. It is said that, at dawn on old Christmas Day (6th January), the distant sound of a choir singing in an ancient Northumbrian dialect can be heard echoing faintly around the ruins of the Abbey. ← Great Britain, Britain, or the United Kingdom? An interesting tale 🙂 Whitby and the surrounding area is the home of my paternal line of ancestors. Yorkshire hadn’t been invented in Caedmon’s day, CP 🙂 Kingdom of Northumbria. Now I am craving ice cream. Excellent tale and very well told, Mike. Is that the man himself on the bottom section of the cross, jotting down his verses? 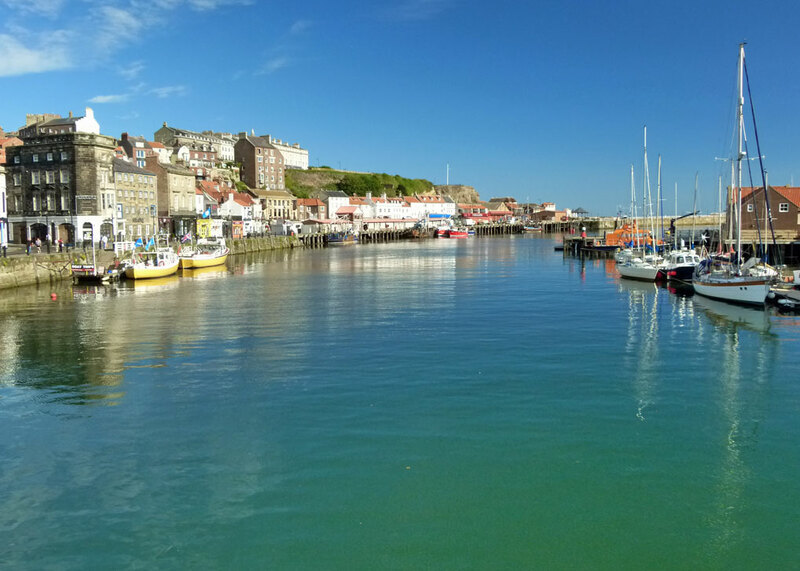 I enjoyed reading Caedmon’s story, Mike and I loved seeing Whitby in the sunshine. It was quite gloomy when we were there. A lovely story, this is. I hope your weather is as perfect there as our is – Happy Easter. I didn’t know about Caedmon or the monumental cross erected for him. Enjoyed the read and also your photo’s. You write so beautifully, Mike. And while the jelly and ice cream was a tad suspect, I’m glad you embellished a bit because it added lots of fun and joy to it! Thank you very much! Glad you enjoyed the minor tweaking..! I had no idea about him. The cross is quite impressive! Beautiful picture of that exquisite cross, and a lovely story. I enjoyed the reading this morning. I don’t recall seeing the cross which is lovely – I think that I was possibly too taken up with Dracula’s tale on my visit, and the extraordinary hearing aid system used by the vicar’s wife inside the church. Jelly and icecream – is that a secret vice of yours? Not any more, Rosemary; the secret’s out! Although I’ve passed this cross several times, I never knew about its story. Thank you for explaining! Beautiful pictures, too (as always on your blog). I’m disappointed that you led us on about the jelly and ice cream. But glad they learned Scripture. Music always makes it easier, though I myself prefer stained glass. And that cross looks suspiciously similar to the one at Durham Cathedral. We had a vet named Caedmon, but I never heard him sing. He was a cattle vet, so it’s possible that he made mooooosic. Impressive cross. I twigged Jelly and ice cream was made up right away as the witchcraft needed to make them probably arrived with the fridge. I tried to make jelly once just using a cool marble shelf in the old larder but it didn’t set properly. I quite like the details you have added to Caedmon’s tale and wish I hadn’t retired from teaching British Literature so I could spice up the tale Britain’s first named poet with a little jelly and icecream for my students!